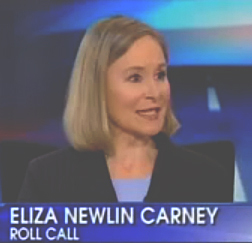 Eliza Newlin Carney is a Washington writer, editor and columnist specializing in political money and democracy issues. She writes the Democracy Rules column for The American Prospect, focusing on campaign financing, ethics, lobbying and voting rights. Carney is also founder and president of The Civic Circle, a nonprofit that will bring civics alive for elementary schoolers, using music and drama shared in assembly and after-school programs. A longtime K Street and campaign finance trend spotter, Carney coined the term “super PAC,” and has covered lobbying fights over health care, Wall Street regulations, defense spending, sugar subsidies, spectrum auctions and more. Carney’s previous posts include senior editor at The American Prospect, senior writer at CQ Roll Call, and writer and columnist for National Journal. She has offered commentary as a guest on C-SPAN, CNN, Fox News, National Public Radio and the PBS NewsHour. She has been a panelist at the American Political Science Association’s annual conference; the Bipartisan Policy Center; the Brookings Institution; the Cato Institute; the National Press Club Speaker’s Bureau and the Sunlight Foundation, among others. Carney has also worked as a freelance writer, with articles in Adoptive Families, American Journalism Review, Government Executive, Governing and Presstime magazines, among others. Carney previously covered Capitol Hill for States News Service, where her subscribing newspapers included The New York Times and The Evening Sun of Baltimore. Carney’s other experience includes working as an adjunct journalism professor at George Washington University’s School of Media and Public Affairs. She has a Master’s degree from Columbia University’s Graduate School of Journalism, and a B.A. from Swarthmore College. Her work has been recognized by the Capital Press Women and the Philadelphia Press Association. A choral singer, songwriter and acoustic music promoter in her free time, Carney produced a children’s CD titled “Love Flows Down” in 2007. She lives in Silver Spring, Md., with her husband, USA Today editorial writer Dan Carney, and their daughter, Elizabeth.